(March 1, 2014, Toronto, ON – FOR IMMEDIATE RELEASE) Residents from across the GTA will join LEAF (Local Enhancement & Appreciation of Forests) and Friends of Trinity Bellwoods Park for the Winter Tree Identification Tour this weekend. Understanding that it can be a challenge to tell many of the common urban tree species apart in the winter, the two groups are taking the guesswork out of tree ID. This tree tour will provide a special chance to learn about the architecture, twigs, bark and buds that are hidden throughout the rest of the year. 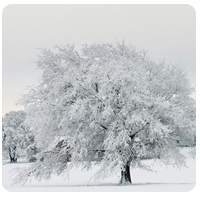 When: Saturday, March 1, 2014, 1:00 p.m. – 3:00 p.m.
A short lesson on tree identification basics inside the Recreation Centre will kick off the event, before the group heads outside for the walk. Mr. Sherman will explore the diversity of species in this popular downtown park as participants discover the hidden identities of its trees. Along the route, he will share a number of easy tricks that guests can use to identify the species in their own neighbourhoods following the tour. Volunteer-run Friends of Trinity Bellwoods Park will share stories and information on their Adopt A Tree Program, which asks local residents to water and nurture young park trees.